In the years following the Pilgrims' arrival and founding of Plymouth in 1620, the Puritan population of New England grew rapidly as new colonies and towns were founded. Through the first several decades of settlement, the Puritans maintained an uneasy but largely peaceful relationship with the neighboring Wampanoag, Narragansett, Nipmuck, Pequot, and Mohegan tribes. Treating each group separately, the Puritans bartered European products for Native American trade goods. As the Puritan colonies began to expand and their desire for trade goods lessened, the Native Americans began exchanging land for tools and weapons. In 1662, Metacomet became Sachem (chief) of the Wampanoag after the death of his brother Wamsutta. Though long distrustful of the Puritans, he continued to trade with them and attempted to maintain the peace. Adopting the English name Philip, Metacomet's position became increasing tenuous as the Puritan colonies continued to grow and the Iroquois Confederation began encroaching from the west. Unhappy with Puritan expansion, he began planning attacks against outlying Puritan village in late 1674. Concerned about Metacomet's intentions, one of his advisors, John Sassamon, a Christian convert, informed the Puritans. Though Plymouth governor Josiah Winslow took no action, he was stunned to learn that Sassamon had been murdered in February 1675. 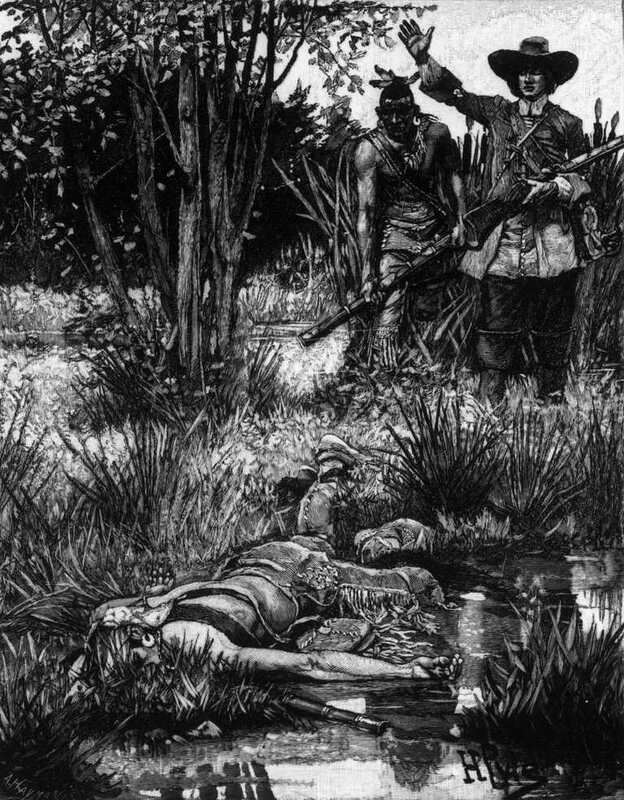 After finding Sassamon's body under the ice in Assawompset Pond, the Puritans received intelligence that he had been killed by three of Metacomet's men. An investigation led to the arrest of three Wampanoags who were subsequently tried and convicted of the murder. Hung on June 8, their executions were viewed as an impingement on Wampanoag sovereignty by Metacomet. On June 20, possibly without Metacomet's approval, a group of Wampanoags attacked the village of Swansea. Responding to this raid, Puritan leaders in Boston and Plymouth immediately dispatched as force which burned the Wampanoag town at Mount Hope, RI. As the summer progressed, the conflict escalated as additional tribes joined with Metacomet and numerous raids were launched against Puritan towns such as Middleborough, Dartmouth, and Lancaster. In September, Deerfield, Hadley, and Northfield were all attacked leading the New England Confederation to declare war on Metacomet on September 9. Nine days later a colonial force was beaten at the Battle of Bloody Brook as they sought to collect crops for the winter. Continuing the offensive, Native American forces attacked Springfield, MA on October 5. Overrunning the town, they burned majority of the settlement's buildings while the surviving colonists took shelter in a blockhouse owned by Miles Morgan. This group held out until colonial troops arrived to relieve them. Seeking to stem the tide, Winslow led combined 1,000-man force of Plymouth, Connecticut, and Massachusetts militia against the Narragansetts in November. Though the Narragansetts had not been directly involved in the fighting, it was believed they were sheltering the Wampanoags. Marching through Rhode Island, Winslow's force attacked a large Narragansett fort on December 16. Dubbed the Great Swamp Fight, the colonists killed around 300 Narragansetts for a loss of around 70. Though the attack critically damaged the Narragansett tribe, it led to the survivors openly joined with Metacomet. Through the winter of 1675-1676, the Native Americans raided numerous villages along the frontier. On March 12, they penetrated into the heart of Puritan territory and directly attacked Plymouth Plantation. Though turned back, the raid demonstrated their power. Two weeks later, a colonial company led by Captain Michael Pierce was surrounded and destroyed by Native American warriors in Rhode Island. On March 29, Metacomet's men burned Providence, RI after it was abandoned by the colonists. As a result, the bulk of Rhode Island's Puritan population was forced to leave the mainland for the settlements of Portsmouth and Newport on Aquidneck Island. As the spring progressed, Metacomet was successful in driving the Puritans from many of their outlying villages and forced the settlers to seek the safety of the large towns. With the weather warming, Metacomet's momentum began to fade as a shortage of supplies and manpower began to hamper his operations. Conversely, the Puritans worked to improve their defenses and began successful counterattacks against the Native American allies. In April 1676, colonial forces killed the Narragansett chief Canonchet, effectively taking the tribe out of the conflict. Allying with the Mohegan and Pequots of Connecticut, they successfully attacked a large Native American fishing camp in Massachusetts the following month. On June 12, another of Metacomet's forces was beaten at Hadley. Unable to secure alliances with other tribes such as the Mohawk and short on provisions, Metacomet's allies began to leave the ranks. Another bad defeat at Marlborough in late June hastened this process. As increasing numbers of Native American warriors began surrendering in July, the Puritans began dispatching raiding parties into Metacomet's territory to bring the war to a conclusion. Retreating to Assowamset Swamp in southern Rhode Island, Metacomet hoped to regroup. On August 12, his party was attacked by Puritan force led by Captains Benjamin Church and Josiah Standish. In the fighting, a converted Native American, John Alderman, shot and killed Metacomet. Following the battle, Metacomet was beheaded and his body drawn and quartered. The head was returned to Plymouth where it was displayed atop Burial Hill for the next two decades. Metacomet's death effectively ended the war though sporadic fighting continued into the next year. In the course of King Philip's War, around 600 Puritan settlers were killed and twelve towns were destroyed. Native American losses are estimated at around 3,000. During the conflict, the colonists received little support from England and as a result largely financed and fought the war themselves. This aided in the early development of a separate colonial identity which would continue to grow over the next century. With the end of King Philip's War, efforts to integrate colonial and Native American society effectively ended and a deep resentment took hold between the two groups. The defeat of Metacomet broke the back of Native American power in New England and the tribes never again posed a critical threat to the colonies. Though badly injured by the war, the colonies soon recovered the lost population and rebuilt the destroyed towns and villages. What Happened in America in the 1650s?